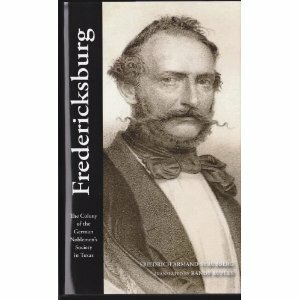 Randy Rupley, local author and translator, will be signing his recently published book which is a translation of the novel by Friedrich Armand Strubberg, Fredericksburg (Fredericksburg: The Colony of the German Noblemen’s Society in Texas) on Saturday, January 28, 2012 from 10:00 A. M. until noon at the Pioneer Museum. Mr. Rupley is actively involved in translating German manuscripts into the English language. You are invited to share a different perspective on the history of Fredericksburg in the 1850’s. Friedrich Armand Strubberg who was also known as Dr. Schubert first published the book written in German in 1867. Most of the stories concerning the adventurous life of this character are based on the sensational stories he wrote himself. They contain important eyewitness accounts of events as well as personal observations and his opinions. He may not be remembered as a great colonizer, but he certainly deserves to be remembered as a great novelist who wrote about the early activities in the Texas Hill Country. His book is available for purchase at the Pioneer Museum Gift Shop at 325 W. Main Street.